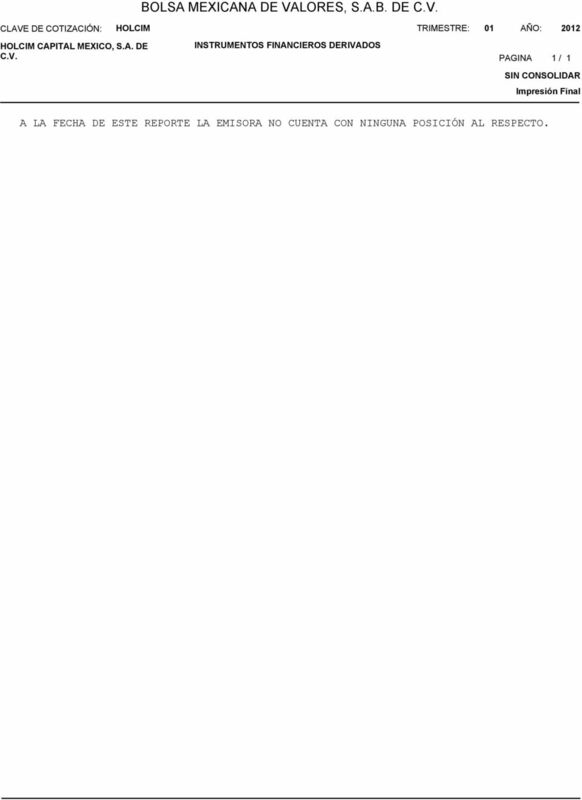 7 CAPITAL MEXICO, S.A. DE COMENTARIOS Y ANALISIS DE LA C.V. ADMINISTRACIÓN SOBRE LOS RESULTADOS DE PAGINA 1 / 1 OPERACIÓN Y SITUACIÓN FINANCIERA DE LA COMPAÑÍA CAPITAL MÉXICO, S.A. DE C.V. CAPITAL MÉXICO S.A. DE C.V., ES UNA SOCIEDAD MERCANTIL QUE SE CONSTITUYÓ EN JULIO DE 2011, SUBSIDIARIA DIRECTA DE LTD., CUYO OBJETO SOCIAL PRINCIPAL ES OBTENER Y OTORGAR FINANCIAMIENTOS, ASÍ COMO EMITIR, COLOCAR Y OFERTAR TÍTULOS DE CRÉDITO O VALORES, ENTRE OTROS. 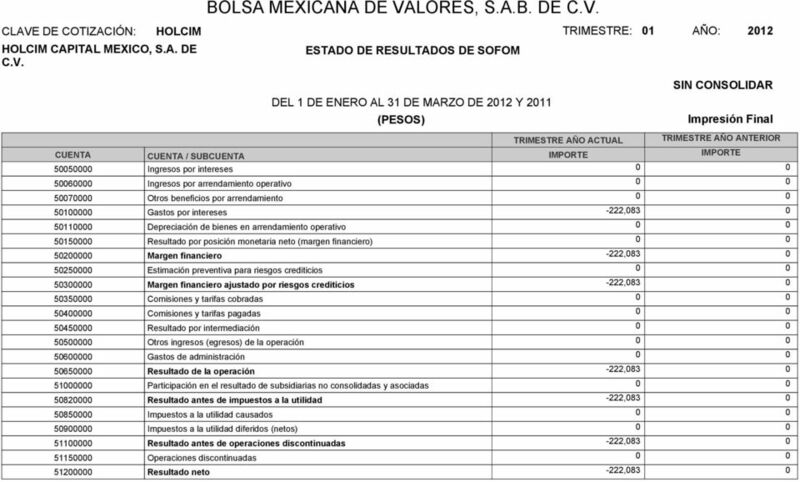 EL 30 DE MARZO DEL 2012, CAPITAL MÉXICO COLOCÓ EXITOSAMENTE CERTIFICADOS BURSÁTILES POR $ 1,500,000,000 CON LA GARANTÍA DE HOCLIM LTD A UN PLAZO DE 3 AÑOS CON FECHA DE VENCIMIENTO FINAL EL 27 DE MARZO 2015 Y CON SPREAD DE 57 PUNTOS BASE SOBRE LA DE TIIE DE 28 DÍAS. 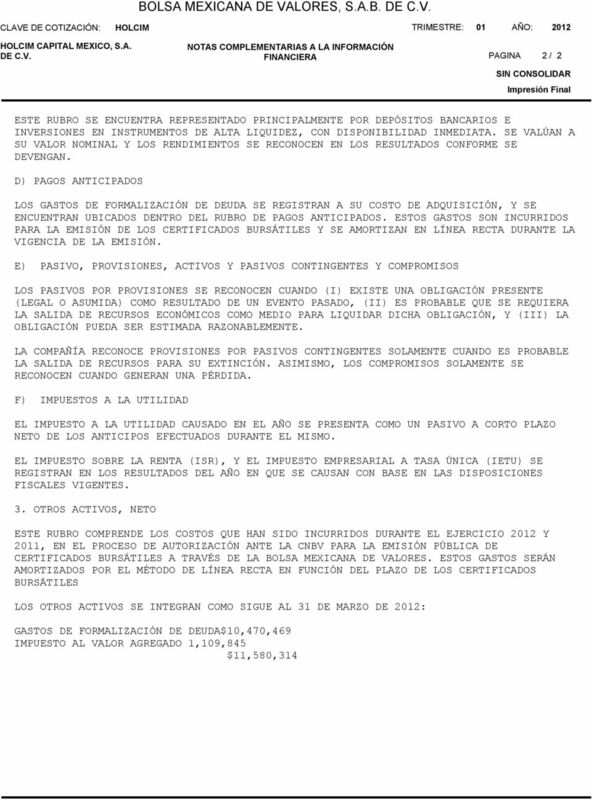 LA COMPAÑÍA RECIBIÓ EL MONTO DE LA EMISIÓN ANTERIORMENTE MENCIONADO, MENOS $ 6,1000,000 DE GASTOS RELACIONADOS CON LA COLOCACIÓN Y ESTRUCTURACIÓN, PARA RECIBIR UN NETO DE $ 1,493,900,000. 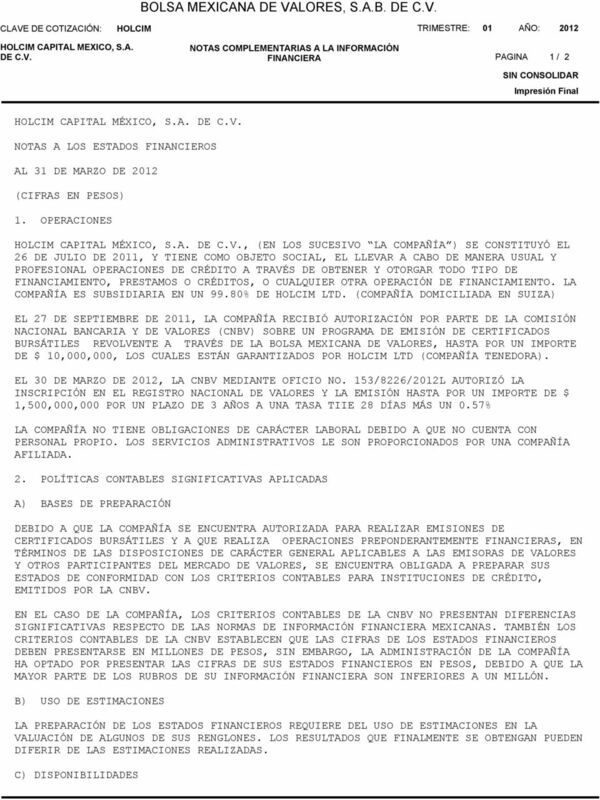 LA EMISORA PAGÓ EL CRÉDITO OBTENIDO DE CEMENTOS APASCO S.A. DE C.V. POR $ 4,500,000 QUE UTILIZÓ PARA HACER FRENTE A SUS OBLIGACIONES Y GASTOS PREOPERATIVOS. 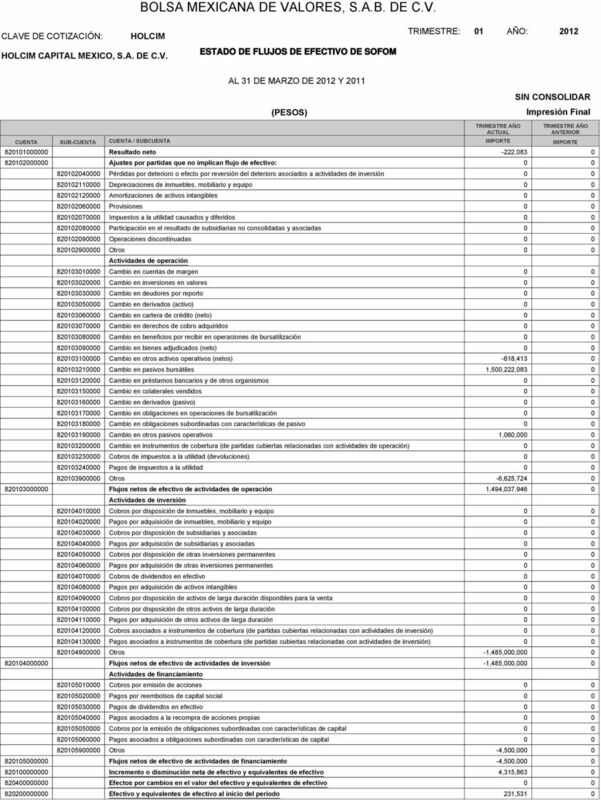 ADICIONALMENTE, LA EMISORA COLOCÓ UN CRÉDITO INTERCOMPAÑÍA CON CEMENTOS APASCO, S.A. DE C.V. POR $ 1,485,000,000 DE QUIEN RECIBIRÁ EL PAGO DE LOS INTERESES DE FORMA MENSUAL. 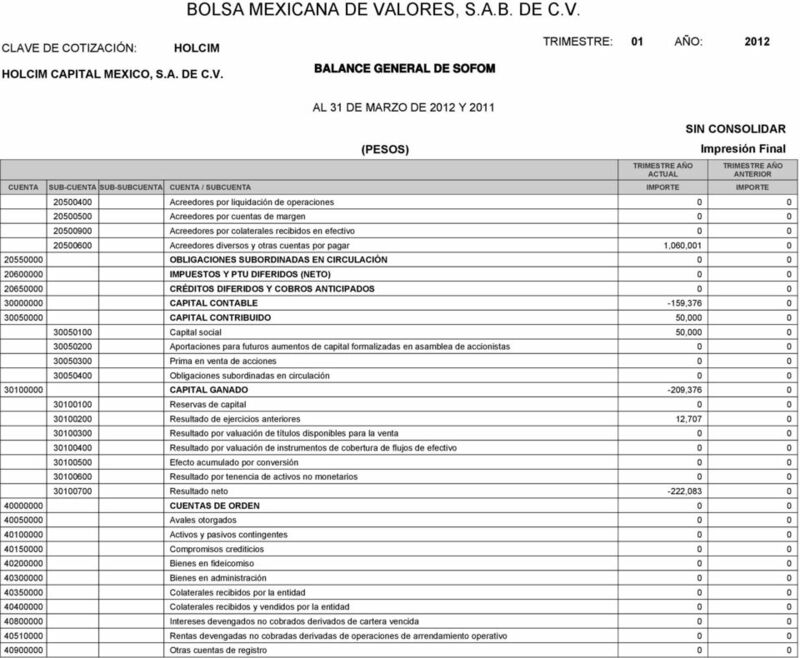 SE ESPERA QUE LA EMISORA GENERE GANANCIAS QUE RESULTEN, EN SU MOMENTO, DE LA DIFERENCIA ENTE LA TASA CREDITICIA QUE COBRARÁ A LAS COMPAÑÍAS DE LAS EMPRESAS DEL GRUPO EN MÉXICO Y LOS INTERESES QUE SE PAGUEN CONFORME A LOS CERTIFICADOS BURSÁTILES Y OTROS CRÉDITOS QUE AL EFECTO SE OBTENGAN. 1. 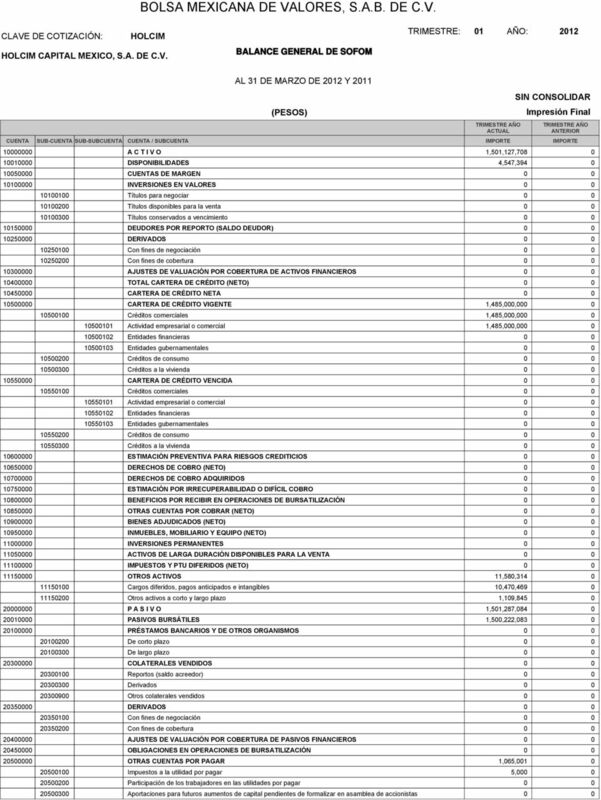 VARIACIONES EN CUENTAS DE BALANCE CARTERA DE CRÉDITO VIGENTE LA CARTERA DE CRÉDITO AL 31 DE MARZO DE 2012, PRESENTA UN INCREMENTO POR $ 1,485,000,000, POR EL PRÉSTAMO OTORGADO A SU PARTE RELACIONADA CEMENTOS APASCO, S.A. DE C.V. OTROS ACTIVOS, NETO ESTE RUBRO COMPRENDE PRINCIPALMENTE LOS GASTOS DE FORMALIZACIÓN DE DEUDA QUE SERÁN AMORTIZADOS POR EL MÉTODO DE LÍNEA RECTA EN FUNCIÓN DEL PLAZO DE LOS CERTIFICADOS BURSÁTILES PASIVOS BURSÁTILES ESTE RUBRO TUVO UN INCREMENTO POR $ 1,500,222,083 DEBIDO A LA COLOCACIÓN Y EMISIÓN DE CERTIFICADOS BURSÁTILES POR $ 1,500,000,000 CON EL PÚBLICO INVERSIONISTA QUE SE ENCUENTRAN GARANTIZADOS POR LTD (COMPAÑÍA TENEDORA), MÁS EL INTERÉS DEVENGADO POR PAGAR DE LA FECHA DE EMISIÓN AL 31 DE MARZO DE VARIACIONES EN CUENTAS DE RESULTADOS GASTOS POR INTERESES EL PRINCIPAL INCREMENTO EN ESTE RUBRO CORRESPONDE A LOS INTERESES DEVENGADOS A FAVOR DEL PÚBLICO INVERSIONISTA. 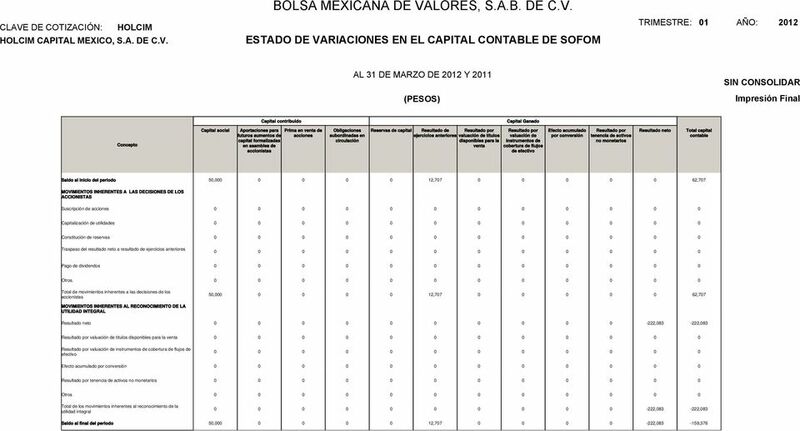 10 BOLSA MEXICANA DE VALORES, S.A.B. 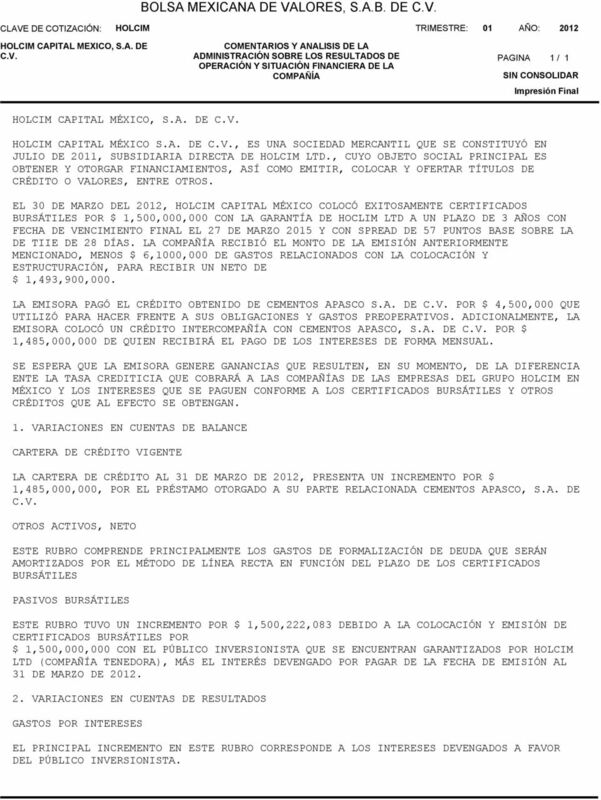 DE C.V. CAPITAL MEXICO, S.A. DE INSTRUMENTOS FINANCIEROS DERIVADOS C.V. PAGINA 1 / 1 A LA FECHA DE ESTE REPORTE LA EMISORA NO CUENTA CON NINGUNA POSICIÓN AL RESPECTO.